Although they hadn't all fasted since sunrise, members of the University and the local community shared a meal at sundown with the campus Muslim community during an event November 10 to raise awareness of Islam and the observances known as Ramadan. Shaikh Yusuf Estes speaks about "Moderation in Islam" during the fifth annual Ramadan Awareness Event in Rome Commons Ballroom November 10. More than 300 people attended the celebration in South Campus Ballroom, which included a recitation from the Quran, prayers facing the setting sun, and gracious hospitality. "In celebrating the month of Ramadan, the ninth month of the Islamic lunar calendar," said Doaa Ammar, "Muslims fast from food, water, and all desires from sunrise to sunset, but really what we are doing is practicing humanity, self-discipline, respect, submission, obedience to one God, and peace among ourselves and others." Ammar is a sixth-semester management information systems major and co-vice president of the Muslim Students Association, which organized the event. "Today, the media has told us that Muslims are hijackers, terrorists, kidnappers," she said. "But for those who look beyond the media propaganda that has shadowed the reputation of Islam, you will find a religion based on peace and submission to one Almighty God. A religion that does not differentiate between its followers in race, color, or ethnicity. A religion that embraces all people who submit to one God, and judges them only on the strength of their faith." 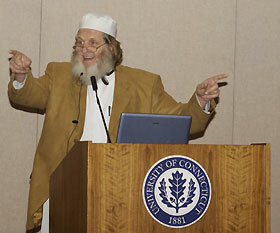 Shaikh Yusuf Estes, National Muslim Chaplain for American Muslims, was the keynote speaker for the event. Estes, a former federal prison chaplain, converted to Islam from Christianity 12 years ago and now travels nationwide spreading the word about Islam. "Estes is about unity and understanding between people of different faiths and beliefs," said Ammar, who introduced him. Estes' theme was moderation in Islam. "Moderation in all things - this is what Islam teaches," he said. "It is the basis of Islam." As part of his work, Estes has founded a website about Islam, where people can post questions and comments. Some of these comments are insulting, he said, but some of those who set out to attack Islam go on to become Muslims. "That happened to me 12 years ago," he said. Estes, who comes from Texas, used to be a Christian preacher until he met a man from Egypt, whom he tried to convert to Christianity . Instead, the Muslim converted him to Islam. Mixing Arabic phrases with English, Estes analyzed the words Allah and Islam. "The root of the word Allah is 'illah,' everything and anything that can be worshiped," he said, "mostly what people call God. "The word 'Islam' is probably the most misunderstood of all words today around the world," he said. "Islam" comes from the root "salaam" or "silm", he said, which has five meanings: surrender - to the commandments of Allah; submission - the acceptance of Allah's authority; obedience - to Allah's law; sincerity - acting with a clean heart; and peace. "These are all part of moderation, fair balance," he said. He said the Quran differs from some other holy books in that it is meant to be recited rather than read. "Today, there are over nine million human beings who have totally memorized it cover to cover, and over 80 percent of them are not Arabs and don't speak the Arabic language," he said. Although many people in the West are critical of the status of women in Muslim society, Estes said that historically, when the religion began, it gave women some rights they did not previously have, such as the rights to own property and to inherit. Addressing the right of a man to marry four wives under Islamic law - a topic many Westerners consider anathema - he said the Quran allows a man to marry up to four wives "only if he can treat them all exactly equally; otherwise, he can have only one." Estes commented that few Muslims have more than one wife. He said there are significant similarities between some of the major world religions. "Many Christians and Jews have recognized the same things [as Muslims]," he said. "It's real sad when two great bodies of people can't come together and live in harmony and peace together, because we're all sons of Adam."